We’d love your help. 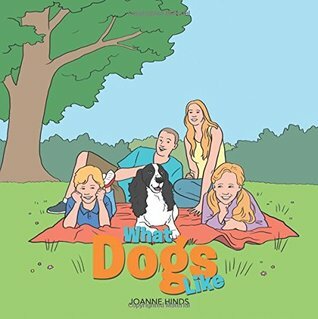 Let us know what’s wrong with this preview of What Dogs Like by Joanne Hinds. What Dogs Like is a book with an important message. Nearly 80 percent of dog bites are from the family or a friend's dog. Written as a read-along rhyme with illustrations, What Dogs Like cleverly helps educate young people as well as their parents on how to behave around their canine friends. To ask other readers questions about What Dogs Like, please sign up. Loved that this book is in rhyme! I can't wait to share it with my little one when she's old enough. It's a fantastic fun way to inform children (and adults too) how to stay safe around dogs, and how to ensure dogs are happy and respected. The illustrations are bold and eye-catching and will help even the youngest children understand the important messages. I definitely recommend for any family with a pet dog, but for all children too! This rhyming story is told in first person's point of view by a dog. The Canine narrator, which remains nameless throughout the book, invites the young readers into his world and teaches them how to interact with dogs. I think this book has an important lesson to teach. As a dog owner, I appreciate the effort done here. I think there is room for more books in this series, like advanced communication techniques for situations not covered in this book, for example, when meeting other dogs in the dog This rhyming story is told in first person's point of view by a dog. I think this book has an important lesson to teach. As a dog owner, I appreciate the effort done here. I think there is room for more books in this series, like advanced communication techniques for situations not covered in this book, for example, when meeting other dogs in the dog park, or when you have company. First of all, there aren't any names in the script, and I find it hard to relate to general descriptions like children, mom, dad etc. I think the story would have been so much better with some "showing" instead of "telling". The artwork on this cover is fun and bright. It gives a good representation of the book's content. Unfortunately, the title is lost in the artwork. The colors chosen for the text don't stand out enough from the background, and the top word blends right in to the picture. A little reshuffling, and this could have worked. There's a lot of wasted space at the top of the cover, so everything didn't need to be crammed into the bottom half. Nicely done. The artwork is bright and attractive, but realistic enough that the seriousness of the lesson is communicated. The illustrator managed to capture the occasional snarling/growling with enough gravity, but without making the picture scary for little readers. This is a great way to introduce an important subject to young readers. I have two (fairly high-strung) dogs, and I've seen first-hand the problems that arise when a dog is put in a stressful situation. Kids aren't always taught to treat pets properly. In fact, pets are frequently treated as just another toy. It's hardly surprising that kids get nipped from time to time. I'm not thrilled with the approach though. I feel like the rhyming obscures the point. I like the idea of the dog as narrator, but be prepared for a little discussion to make sure your kids understand the importance of the lesson.